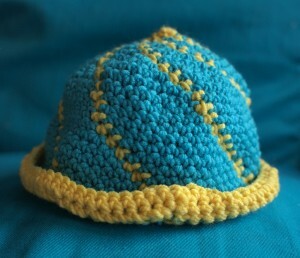 This idea for this hat came about when I noticed the spiral pattern formed in the base of my little crocheted bowl. I wondered if I could pick out the spirals in a different colour without too much thinking or counting. Turns out I could! In fact, using the yellow wool made the whole process much easier because it made it really clear where I needed to increase and I hardly had to count anything. 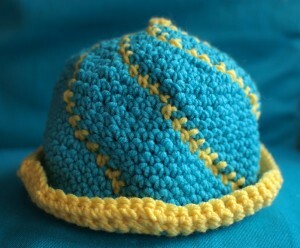 The hat in this pattern would be perfect for a newborn but unfortunately the baby I intended it for is nearly one. I’ll have to make her a bigger one. It would be easy to adapt this for an adult too. 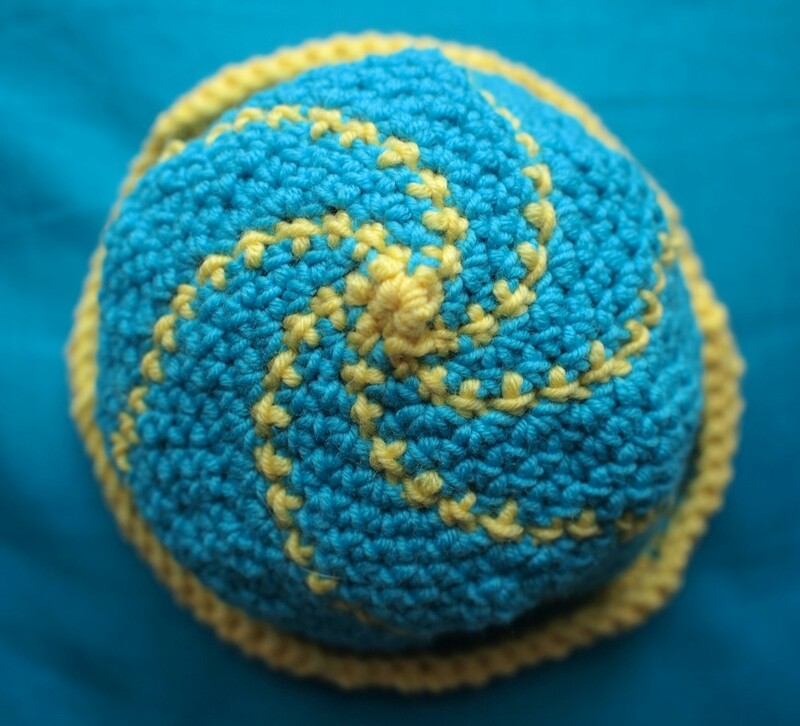 Tutorials for magic circle, single crochet (SC), and increase can be found in the crochet section of this site. Row 1: Create a 6 stitch magic circle with yellow wool. To create the spirals (and the top of the hat) you need to increase with blue in the stitch before a yellow stitch on each row. Hold the yellow behind your work using the intarsia method. Row 3: SC, increase before each yellow stitch. (18 stitches). Row 4: SC, increase before each yellow stitch. (24 stitches). Row 5: SC, increase before each yellow stitch. (30 stitches). Row 6: SC, increase before each yellow stitch. (36 stitches). Row 7: SC, increase before each yellow stitch. (41 stitches). Row 8: SC, increase before each yellow stitch. (47 stitches). Row 9: SC, increase before each yellow stitch. (54 stitches). Row 10: SC, increase before each yellow stitch. (60 stitches). If you want to make a bigger hat than the one pictured you will need to add more rows here, still increasing with blue before every yellow stitch. For a hat for a one year old, I am intending to add another 2 rows (72 stitches). Change to yellow wool for all stitches. Row 23 – 28 : SC in yellow. Increase 6 times in each row, space increases evenly. Pull wool through final loop. Weave in loose threads.